Creating a family tree is a good way to organize family information and learn the family history. With Edraw family tree template and drawing tools, one can make a nice family tree instantly and easily. A Family Tree is a chart represents the relationships of your family members in a traditional tree structure. It's a graphic depiction of the family history and hierarchical structure with basic information included, such as names, dates of birth and passing, photos, and etc. Making a family tree is a rewarding process because it can bring the following benefits. 1. It's a good way to organize information about ancestors and relatives in the same family, and understand how they are all connected. 2. It's a great exercise to learn about your family history with a historical perspective. 3. Making a family tree can be an essential way to help children understand their heritage. It's a good chance for them to know about their great grandparents or family members they never had the chance to meet. 4. It can be a good opportunity for adults to memorialize people who have passed away and make a representation of the family history. Edraw family tree software provides a large number of high-quality built-in card shapes, photo card shapes and custom shapes for making family trees. It contains abundant shape styles allowing for diversity designing. All the symbols are in vector format and available in modification. Simply drag and drop any symbol you would like to use from the library pane. If you want to learn more on this part, please visit Smart Shapes for Drawing Family Tree page for more information. Turn to your relatives and the elders to know more about your family hierarchy, or ask family members to go through old documents, pictures, videos or slides, if available. You have to decide how many generations you want to include in your chart. Usually a family tree carries only a few generations due to limitation of the information you can get and the size of paper you use. Many people choose to go as far back as their great great grandparents and their siblings, or their great grandparents and their siblings. These people have closer relationship than more distant relatives. Compile the information and make a draft. Start Edraw, on the File menu, point to New, point to Organizational Chart under Available Templates, and double click the Family Tree template. A new drawing page will open. Go to the library pane on the left of the canvas. 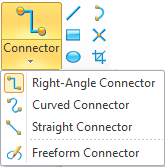 Drag the shapes you need onto the canvas. You can choose shapes with or without photos. Select a card shape. Click the right floating button to add spout or sibling; while click the bottom floating button to add children. Double click on the default text of the card shape to edit new text. Use the action button on the top right corner to replace photo. You can change the shape color, border line and shadow style from the quick button under Home tab. You can also choose a quick style from the quick style list. On Home tab click Connector button and choose a connector style to draw. When a family tree is done, it's easy to print and share with more people. On the file menu, point to Print to set for print options. You can change settings with fewer clicks and see the print preview in real time. Go to Print Edraw Diagrams for detailed information about printing. Edraw offers support for exporting your diagram to various formats, including Microsoft Office, PDF, and many other graphic formats. On the File menu, point to Export & Send for Export options. Find more instructions on Export Edraw to other Formats. 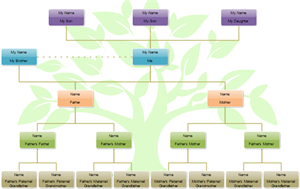 Here is a complete example of family tree created by Edraw.